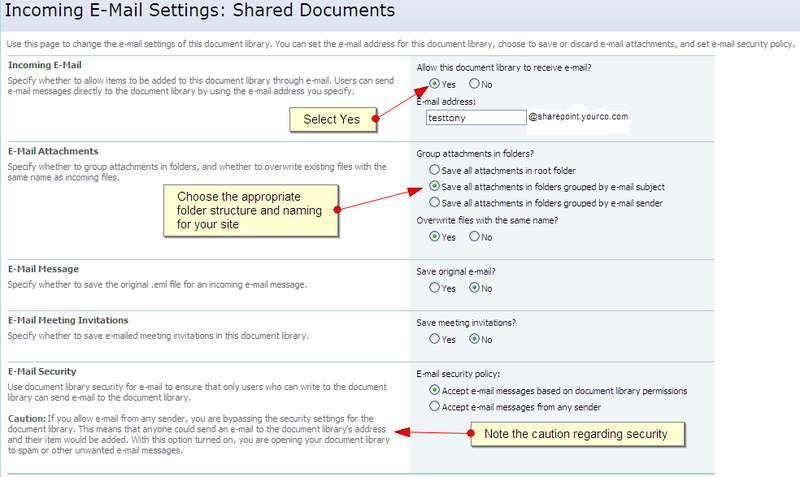 Step 2 – Navigate to the Document Library you want to e-mail enable. I will use “Shared Documents” for this example. Enter an e-mail name for users to send files to this library. You may want to use some form of the document library name. Since this is a test run for me, I used ‘testtony’ and plan to change it once I know it is working fine. Note that the full email address contains “@sharepoint” dot your company domain. This is something you may have to ensure your e-mail system will allow. You also may have to setup a specific e-mail box and use that address here to allow it to work. See the references at the end of this post. Send an email to the address defined and see if it post to the Document Library. In my case I am using the Subject line as the folder, so I am making sure that works by sending several emails with different subject lines/folder names. No ERROR will display, however a user with Read access to a document library (or folder or specific files depending on how permissions are enabled and if inheritance is broken) may not be able to see files in the library/folder. If a Library has Versioning turned on, then by default files that are uploaded are marked as Draft’s. Also by default people with Read access cannot see Draft documents. Turn Versioning off if it is not really needed for that library. Change the versioning settings to allow draft’s to be seen by Readers. Versioning On – If approvals are setup, then a draft can be Approved and become visible to people with Read access – even if the versioning setting to view drafts is not set for readers. When in the Versioning Settings screen for a Document Library, follow the link “Learn about specifying who can view and edit drafts” in the Draft Item Security section to learn more about these settings and how the permissions are impacted. You can specify whether files that are pending approval can be viewed by people with permission to read, people with permission to edit, or only the author and people with permission to approve items. If both major and minor versions are being tracked, the author must publish a major version before the file can be submitted for approval. When content approval is required, people who have permission to read content but do not have permission to see draft items will see the last approved or major version of the file.